Tell us how we can help!Sold Out TourIce CavesTour EquipmentTour Meeting LocationIce Adventure TourLake Canoe TourBrewery Tour and TastingSomething Else! If your desired tour time and date are sold out or have fewer spaces available than you require, please complete a Waitlist Request. Saw photos of an ice cave and want to know if you'll see any? An Ice cave is a naturally forming glacial feature that is as random as it is unpredictable. We are only able to explore a cave when it is deemed safe by our expert guiding team. We unfortunately cannot guarantee ice caves as there is no best month to experience them, nor is there an average percentage of tours in which they occur. However, there are many natural glacial features which are regularly experienced, such as moulins, seracs, blue pools, and crevasses. For more information, please visit our FAQ Page. Want to know what to wear and bring for your tour? We have great news! Our tours are all-inclusive for any necessary equipment required for the activity. We provide everything needed to be safe and stay dry while in the Alaskan wilderness. For details, please see the inclusions for the specific tour you are interested in reserving. While we do have everything on hand to keep you looking like a professional adventurer, there are a few personal items we do not provide that are highly recommended. In order to dress appropriately for the weather in Southeast Alaska, we suggest wearing comfortable, non-cotton layers. If it is cooler, please bring a hat, gloves and wear warm socks. If there is sunshine in the forecast, please bring sunglasses as glacier reflections are very bright! Finally, small bags are allowed on tour, and we will provide a 30 liter dry bag to keep your items out of the wet and cold. If you are bringing professional camera equipment, please note that we cannot allow tripods on tour for safety purposes. Want to know what to where to meet us for your tour? We have one meeting location for almost all our glacier and canoe tours. There are 4 cruise ship docks in Juneau, and we will meet you in front of the Mt Roberts Tramway building, which is nearby to the CT Dock (see map below). 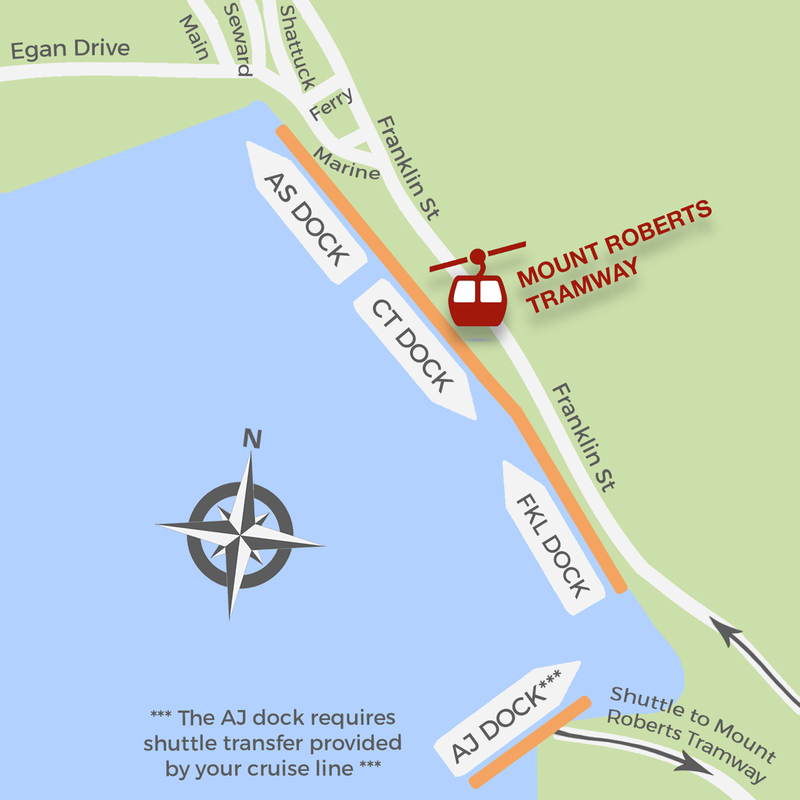 If you are arriving at the AS Dock or the FKL dock, simply walk towards the direction of the CT Dock and you will easily locate the Mt Roberts Tramway building. The walk from either direction is approximately 5-7 minutes along the wooden dockside boardwalk. If you are arriving at the AJ Dock, you can take the provided shuttle busses in front of your ship which will drop off at only one location, in front of the Mt Roberts Tramway. For Guests arriving on the Norwegian Joy for a 7:15am tour or the Norwegian Bliss for a 3:00pm tour, we will collect you outside your cruise ship at the AJ Dock. Finally, for Guests going on our Alaskan Brewery Tour and Tasting, please make your way to the Alaskan Brewery Depot which is located at 219 S Franklin St, Juneau, AK 99801. All Meeting Instructions are included within your reservation confirmation email.